It may not always be lovely weather outdoors, but you’ll definitely have springtime in your heart and maybe a spring in your step too when you carry the Eliana Shell for Classic Bags. 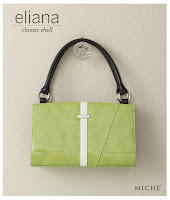 High-gloss faux leather in an extra-juicy shade of lime green is tastefully accented by a single white stripe and white stitching details. Base bag not included.